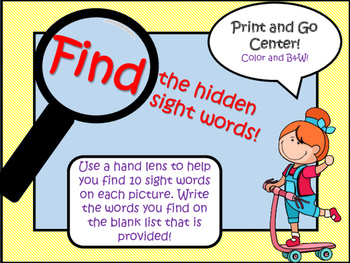 A new and exciting way to review sight words! Students use a hand lens to help search for the hidden sight words (High frequency words). Once they spot a sight word they write the word down on their "Sight Word List". Their goal is to find ten sight words on each mat. 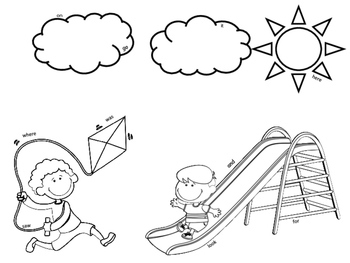 Set includes three different color mats with an outdoor or play scene with ten hidden sight words typed in small print(font size 11) Color mats are also available in black and white for easier printing and for you to print for students to circle hidden words as an option. 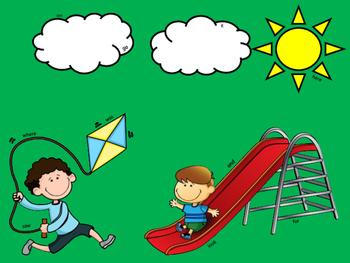 Set includes sight words:can, find, see, for, up, come, little, help, me, on, go, it, here, where, saw, was, and, look, play, you, make, said, is, we, in, two, the, my. 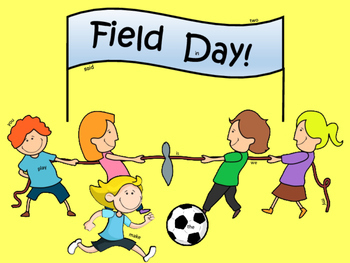 This activity can be used an independent practice, small group or Daily Five center activity. Extra homework for intervention.